1 In medium bowl, combine Hellmann's® or Best Foods® Mayonnaise Dressing with Olive Oil with mango chutney. Add remaining ingredients. Season, if desired, with salt and ground black pepper. 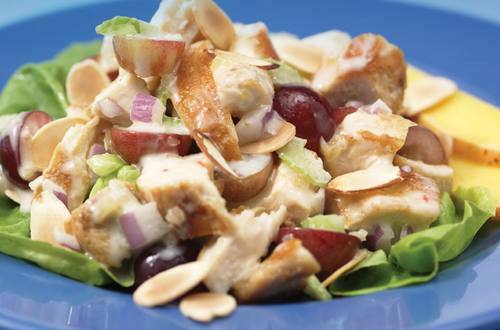 Serve, if desired, on lettuce and garnish with toasted sliced almonds. Chill, if desired. Also terrific with Hellmann's® or Best Foods® Real Mayonnaise, Light Mayonnaise, Low Fat or Canola Mayonnaise Dressing.